We will provide much needed studio space for professional makers and a series of workshops and classes for beginner and experienced potters. Clay Shed is a ceramic studio in Lawrence Hill, Bristol created by four artists and designers eager to share their passion for clay. 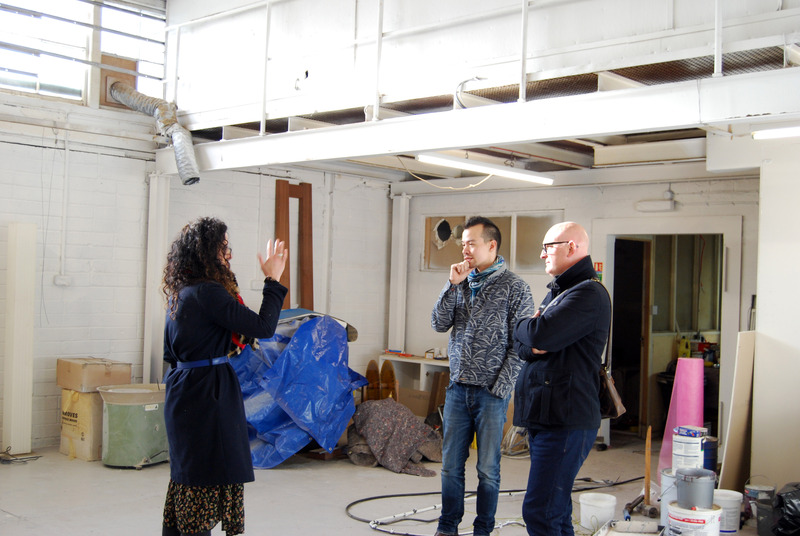 We will provide much needed studio space for professional makers at competitive rates. Our purpose built teaching space will deliver a series of workshops for budding beginners and experienced ceramicists alike. The idea of Clay Shed came about in Spring 2018 when 4 friends identified the need for a ceramic studio in Bristol for professional makers. 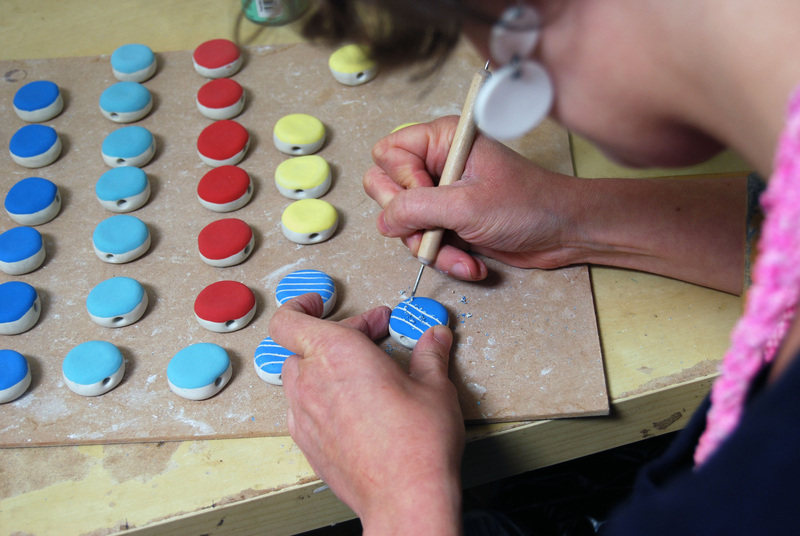 Our aims and objectives are to provide a full time space for makers to access specialist facilities which will include their own personal studio, break out space, wheels, kilns and glaze facilities. Maker’s can benefit from a communal kitchen, free wifi, 24 hr access and being part of a creative community which nurtures professional development. Our purpose built class room will host a range of classes and workshops to suit all levels and abilities. This will include a regular programme of hand building and throwing sessions over a series of weeks as well as one off specialist workshops. We welcome other creative enterprises to hire our space to run classes. Why do we need 12K? It turns out that converting an old cabinet maker’s warehouse into a superbly equipped ceramic studio costs a lot of money. Whilst we have self funded a huge amount of this project so far and are able to do a lot of work ourselves, there are some things we need professionals to do. Raising an extra 12k will help us to update the electrics, install plumbing and heating and generally make a lovely habitable space. This money will also help contribute to purchasing kilns, wheels and other specialist equipment. We will be able to fit out the studio with bespoke tables, shelving and windows that don’t leak (which is high on our priority list). Director's Louise and Dave discussing plans in the same tenant's space after a massive clear out. After several false starts we came across Unit 6 at Russell Town Avenue Industrial estate in summer 2018. 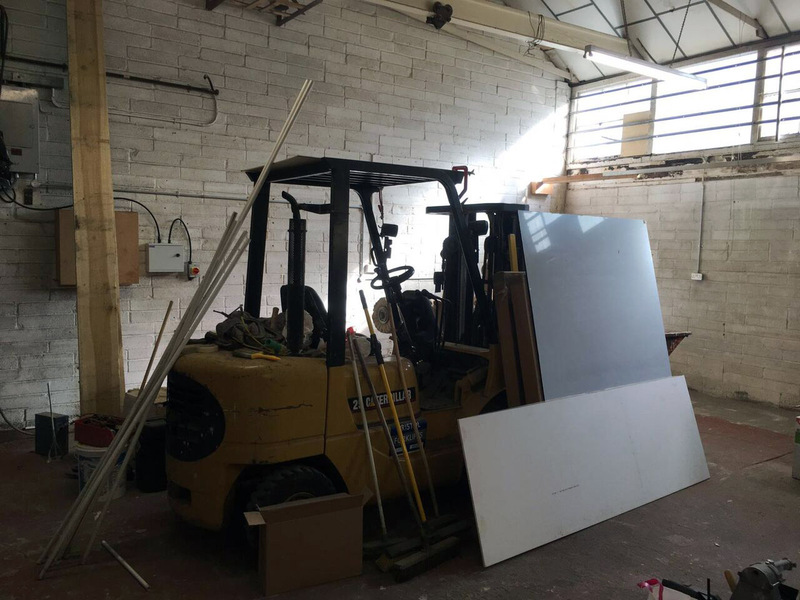 From the moment we squeezed past the JCB parked inside and climbed over old stacks of veneer, we knew this unit had the potential to be our studio. 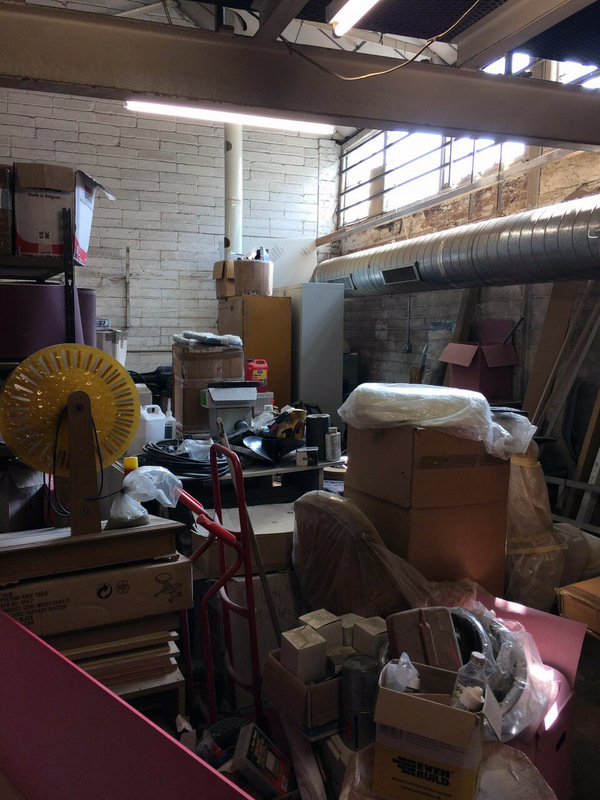 An old cabinet maker’s warehouse left untouched for 10 years, we set about helping the landlord clear the space in late September. Years of being unused has left the unit in a slightly sorry state of affairs. But we see huge potential. Our intention is to transform the main room into our tenant’s studio with purpose built spaces for up to 8 makers. Our classroom will be a flexible space, suitable for hosting a range of different workshops. We will transform the old lacquer room into a fully functional kitchen and we have already installed a toilet in the former cupboard next door. Our technical room comes off the classroom space. Here we will provide our tenants and students with an area for glazing, plaster and our 3 kilns (so far). The mezzanine floor upstairs has a further space for 2 tenants and this is where you will find Clay Shed management. 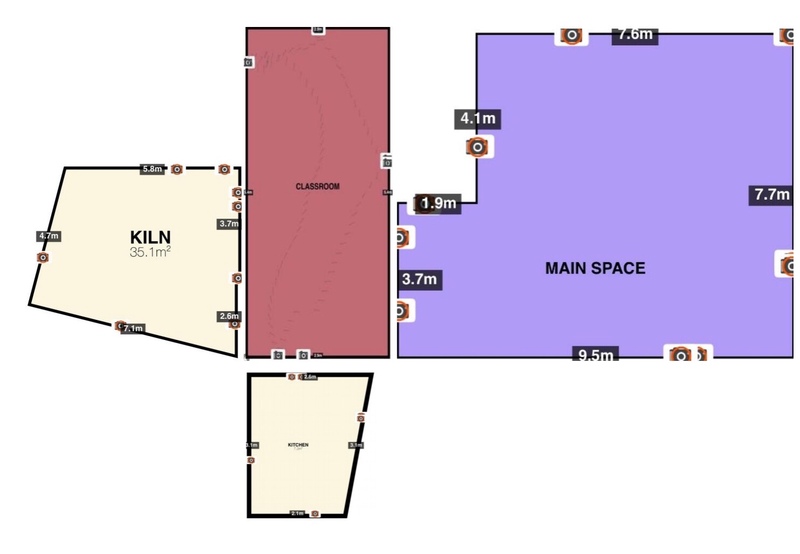 Floor plan of the ground floor studio space. 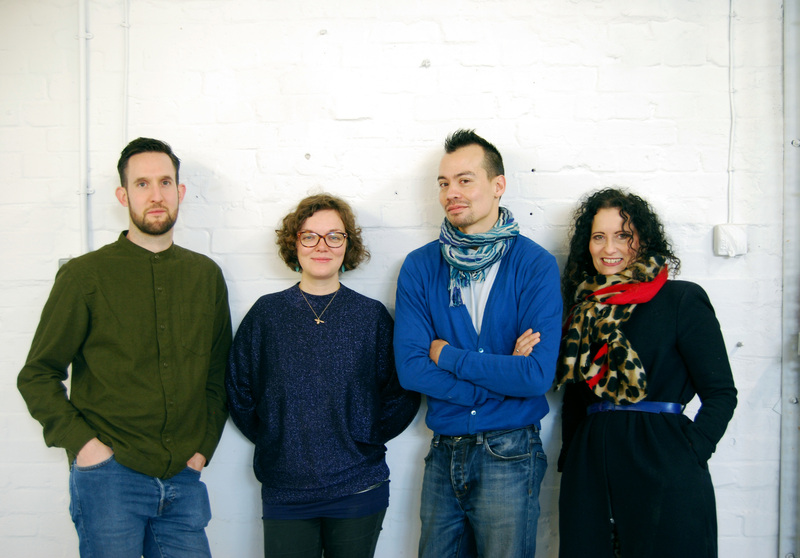 Our founders and directors are Louise Blois, Dave Chilton, Steve Sales and Alice Shields.  Having met through Bristol’s creative scene our team have nearly 30 yrs experience of making between them ranging from running successful businesses to teaching and post graduate study at Bath Spa University and Cardiff School of Art & Design. Left to right: Steve, Alice, Dave and Louise. Community is a big word for us. Through setting up Clay Shed we want to nurture not only the professional makers within our own studio space but widen the already existing community of artists and practitioner’s within Bristol. We hope Clay Shed can become a central hub to network, share ideas, knowledge and support practitioners from all disciplines. We feel it is the right time to set up a ceramic studio. Clay is so hot right now (Cheesy Dad joke. Sorry). There are lots of ceramic studios popping up all over the country and within the city of Bristol we want to share our passion for clay with a wider community. From those who have never touched clay before but have always wanted a go on the potter’s wheel to those who want to increase their knowledge and try something new. We would like to get to know our local community as well opening up our doors throughout the year to welcome new faces into our Shed. Our location in the heart of Lawrence Hill with excellent public transport networks makes us an easily accessible space to get to at any time of the day. 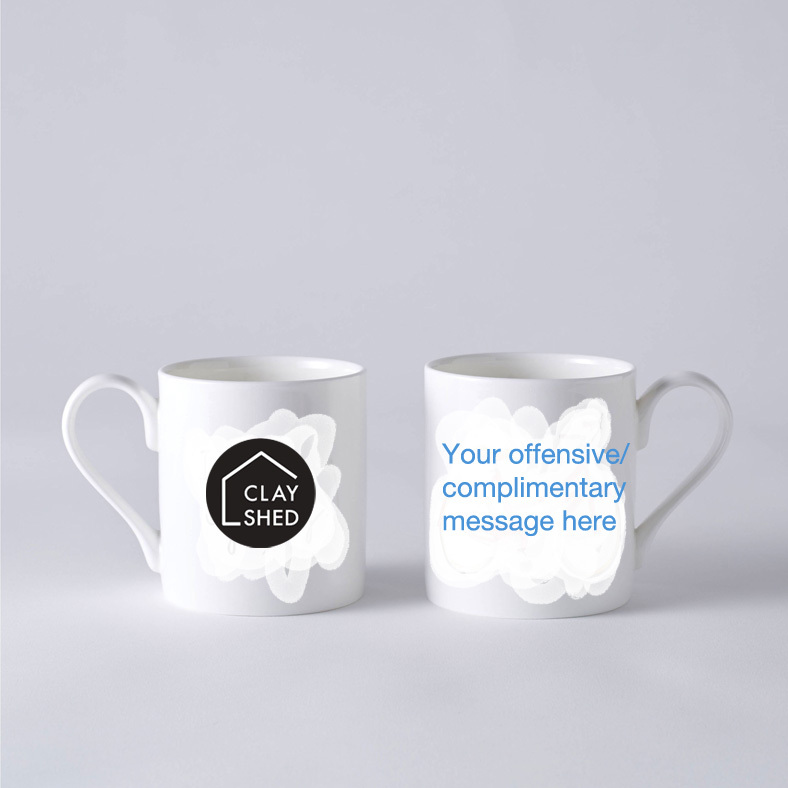 Our £25 reward: Personalise your own limited edition Clay Shed mug. 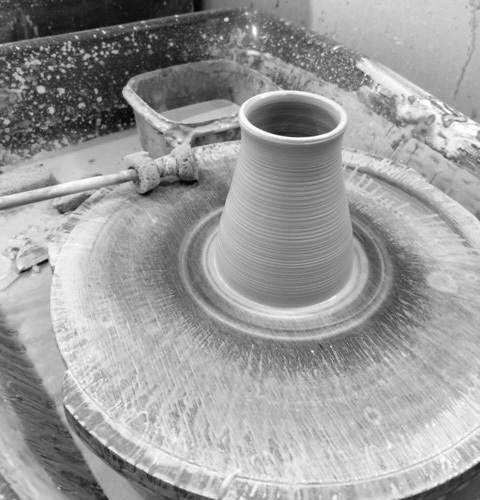 One of our £50 rewards: Taster throwing session on the potter's wheel for beginners. Our £120 reward: Limited edition 6 week Introduction to Hand Building course. 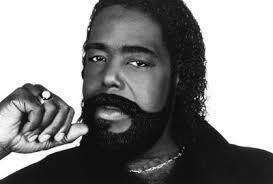 Our £150 reward: Our 'Barry White' special throwing session. Our £300 reward: Group Party workshop for up to 10 ppl. 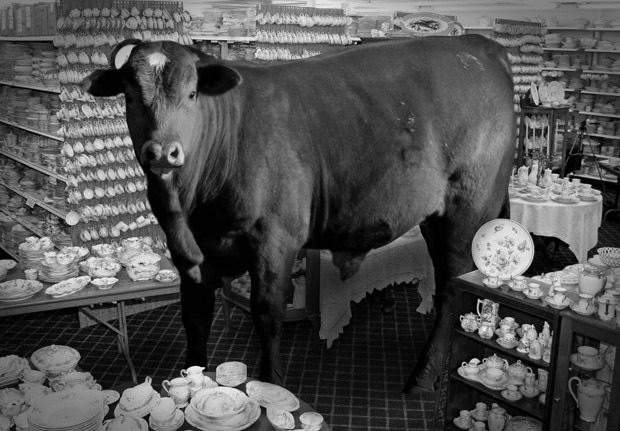 Our £1000 reward: A once in a lifetime 'Bull in a China Shop' experience. Have a smash on us. Say it with Clay (Shed) this Christmas. If you want to purchase one of our rewards as a Christmas gift for someone this year, we'll happily provide a gift voucher for you to fill out. Invite to our launch party. Includes: Prosecco, nibbles, bad dancing. Personalise a mug and plate with an array of ceramic transfers in this 2 hour workshop. Imagine temporary tattoos but these are for ceramics. We'll fire your mug and plate making your design very, very permanent. Includes: ceramic transfers, mug and plate. 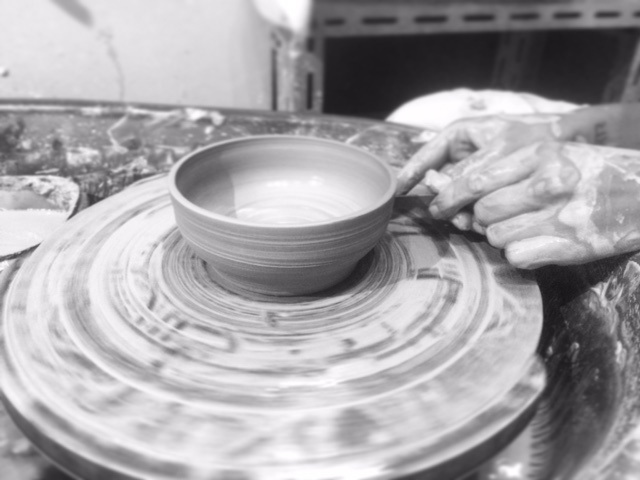 Taster throwing session for beginners on the potters wheel. We'll fire and glaze your best piece. Sessions last for 1 hour. Includes: materials and firings. Make and decorate a one off ceramic piece in this 4 hour workshop. A focused session where you will have the opportunity to develop a specific making process. We'll fire and glaze your best pieces. Includes: materials and firings, tea and coffee. A wheel throwing session for you and your partner. 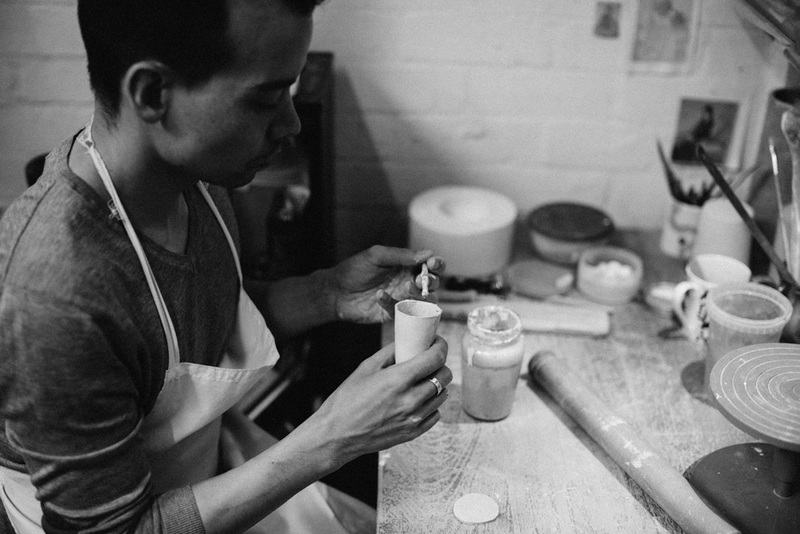 Stoke that romantic flame and treat that special someone to an intimate ceramics experience. Sessions last for 1.5 hours. We'll fire and glaze your best pieces. Includes: materials, firings and rekindled passion. An introduction to a variety of hand building techniques. We'll set a mini project for each session designed to introduce you to a range of making processes. 6 week course, 2.5 hours per session. Includes: materials and firings. Exclusive wheel throwing session for two people. Its just you, your partner, your teacher and Barry White. Sessions last for 1.5 hrs. Includes: prosecco and nibbles. Mood lighting optional. A group workshop for up to 10 adults. Have a go at hand building and throwing on the potter's wheel. Perfect for birthdays, hen, stag or team building opportunities. We'll fire and glaze your best pieces. Sessions last for 2.5 hours. Includes: materials, firings.